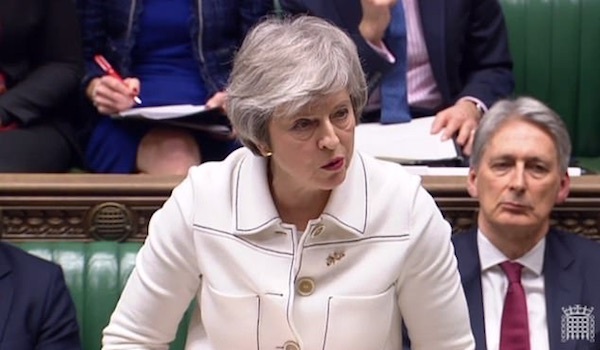 Britain’s departure from the European Union without a deal would make a united Ireland and the break-up of the United Kingdom more likely, Theresa May has told MPs. It is the first time the British Prime Minister has admitted British rule in Ireland and Scotland could be jeopardised by Brexit. She was speaking ahead of Tuesday’s vote on the Withdrawal Agreement she has negotiated with the European Union. Britain’s Direct Ruler Karen Bradley also warned the Tory cabinet last week that she could be forced to call a border poll on Irish unity if there is no deal for Brexit. DUP Deputy leader Nigel Dodds described Mrs May’s comments as “foolish talk” and suggested it was “scaremongering” in order to shore up support for the deal, which unionists oppose. Despite assurances from the European Union today that a ‘backstop’ to prevent a remilitarised border through Ireland should be temporary, it is being widely predicted Mrs May’s deal will be defeated due to her thin working majority, which depends on the DUP, and her limited support within her own party. May said that the backstop, which could leave Britain inside the EU’s Customs Union after a transition period and is strongly opposed by the anti-EU wing of her party, was an inevitable part of any Brexit deal. “Whatever version of the future relationship you might want to see - from Norway to Canada to any number of variations - all of them require a withdrawal agreement and any withdrawal agreement will contain the backstop. And that is not going to change however the House votes tomorrow,” she told the House of Commons. Sinn Fein’s Mary Lou McDonald today described the DUP position on Brexit as “reckless and irresponsible”. “It certainly is not in the interests of the people of the north of Ireland,” she said. “I would urge all political leaders to act in the interests of workers, of communities, of society and political stability. The leader of the Labour Party opposition at Westminster, Jeremy Corbyn, has said he will move quickly to table a motion of no confidence in the Tory government should May fail to win a majority for her deal. The crucial House of Commons vote is set to proceed tomorrow evening and we will cover developments as they take place.